McConnell taught science -- and teachers of science -- at Webster from 1965-2015. A memorial service for longtime Webster University Professor Bill McConnell will be held on campus from 1-3 p.m. on Saturday, Dec. 16, in the Winifred Moore Auditorium in Webster Hall. McConnell touched the lives of countless students and served as a professor at Webster University from 1965-2009, and then continued as an adjunct faculty from 2009-2015. 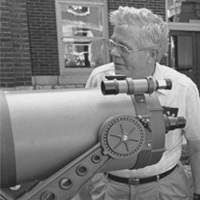 For most of his tenure at Webster he coordinated the MAT in Science program, which he largely pioneered as the MAT program began. His areas of expertise included physics and astronomy. Colleagues and family remember that McConnell truly embraced Webster’s global mission and especially loved his experiences teaching students at the Thailand campus. He once said of his teaching philosophy, “I like to look at the word ‘science’ as a noun, a verb, and an adjective,” noting that it is information, it is action, and it is a state of mind." That approach helped him re-orient traditional text-based science study by also focusing on laboratory work and actual hands-on experience of science. It also earned him several teaching accolades, including the Missouri Science Educator Award in 1969, Webster’s Kemper Award for Excellence in Teaching in 1994, and the Gene Fuchs Memorial Excellence in Teaching Award in 1997. He also received the first-ever Outstanding Science Educator Award, given by the Academy of Science – St. Louis in 2004. In lieu of flowers, memorial gifts can be made to Webster University, for the Bill McConnell Scholarship for the School of Education at webster.edu/giving. Please note “In Memory of Bill McConnell” under "additional comments/special instructions."